I’m currently attending the iGEM synthetic biology competition’s “Jamboree”, where all the teams present their results. It is a big conference (about 3000 attendees this year, representing about 300 teams), so a bit overwhelming. The age constraint seems like a very strange way to divide undergraduates from graduate students. It does not work well in countries where there is mandatory military or civil service before college, and it does not work well for minorities and the poor in the USA. I think that the problem is that the people defining the sections have a very narrow view of what it means to be an undergraduate—one that is colored by their teaching at elite private universities in the US. Looking at the schools most attended by minorities and poor students in the US—the average age of a community college student is 29 [http://www.aacc.nche.edu/AboutCC/Trends/Pages/studentsatcommunitycolleges.aspx]. By using age as a cutoff, iGEM is being quite elitist—their definition of “undergraduate” only matches the demographics at elite private schools. I asked about the reasons for the age cutoff, and it seems like some teams were complaining about having to compete against teams that had 35-year-old students on them, and that this was somehow unfair. I find this mystifying. How is it that a student who worked in a warehouse or tending bar for 15 years before finally being able to afford college has an unfair advantage over a student whose parents had the money to send them to college immediately? I’m a bit more sensitive about re-entry students than many college professors, perhaps because of my mother. Her college education was interrupted by World War II, and she did not get an opportunity to go back to college until her 50s. I am very grateful to the US system of community colleges that allowed her to return to college at that age and earn an AA degree. Being told that she would not have qualified as a “real undergrad” is personally offensive. Coming up with a simple rule that can be applied uniformly around the world to distinguish undergraduate from graduate students is not easy, but I think that a simple age cutoff is one of the poorer choices that could have been made. Years of education since age 5 (to avoid cultural differences in when schooling starts) might be a better choice. Certainly the reasons given for the age criterion (to make the competition fair to undergrads) reveals a real misunderstanding of who undergraduates are outside the elite US colleges. The sinusoidal fits are to all the data (the lower curve), and to the data after cleaning up the bad-weather drops in energy. When I first looked at the data, I realized that a sinusoidal fit to the data would be heavily affected by the cloudy days, which drop power production substantially, so I wrote a script to delete any day whose power was less than the day on either side. Doing three passes of that resulted in most of the really low values being gone, so I fitted a sinusoid to that subset of the data—what I would have gotten if there were no bad-weather days. When using all the data, I averaged about 7.1 kWh a day, with a ±3.4 kWh annual fluctuation. With just the good-weather data, I averaged about 8.1 kWh a day, with a ±3.5kWh annual fluctuation. That means that I’m losing about 1/8 of the potential solar capacity to cloudy weather. 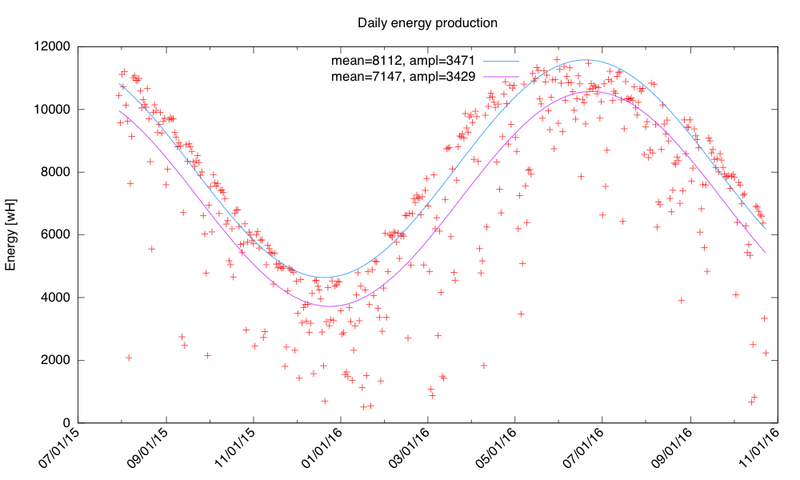 The max and min are within one day of the solstices, so the fitting is doing a pretty good job of finding the phase. The fluctuation is not perfectly fit by a sine wave, though, as the summer peak is a bit broader than the winter valley. If I were ambitious, I would try seeing how well the data fits with the equation of time or the sunrise equation, instead of a simple sinusoid. I don’t think that would actually help the fit much, as I think that the biggest part of the error is due to shadowing by trees or buildings in the early morning and late afternoon, and this shadowing is more pronounced with the low sun angles of winter. This past weekend, I fixed my bike seat (see Broken bike seat and Flexible adhesives). 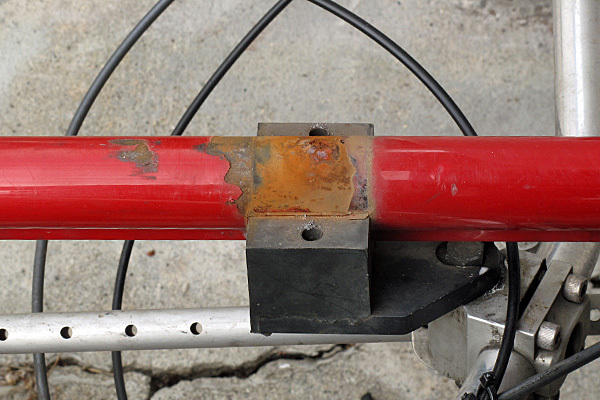 The idea of the fix was simple: to insert at 15mm diameter aluminum rod (6061 alloy, tempered to T6) that spans the break and the high-stress point on the other side of the clamp, which is also scored and likely to fracture, and glue it in place. I found the rod I need at McMaster-Carr, with specifications of 15±0.23 mm diameter. I thought it was slightly undersized at 14.7mm, measuring with my calipers, but my calipers are not so precise that I can be sure of that measurement. Measuring with my micrometer gave 14.82±0.01mm, which is within spec. I could have gotten a more precisely specified aluminum rod for an extra $10, but I did not think that it was worth the extra price—I may come to regret that, as the aluminum rod fits loosely, not snugly inside the tubing. I cut the rod to length with a hacksaw (using oil to lubricate the blade) and ground the sharp edges down with a wet wheel, then sanded the rod both to round the ends and to remove most of the oxide coating and provide a rough surface for the epoxy. The rounded ends are to reduce the stress raisers at the ends of the rods, as that is now where the tubing should flex the most. Aluminum rod: cut, ground, and sanded. The mark indicates where the break in the tubing should be. 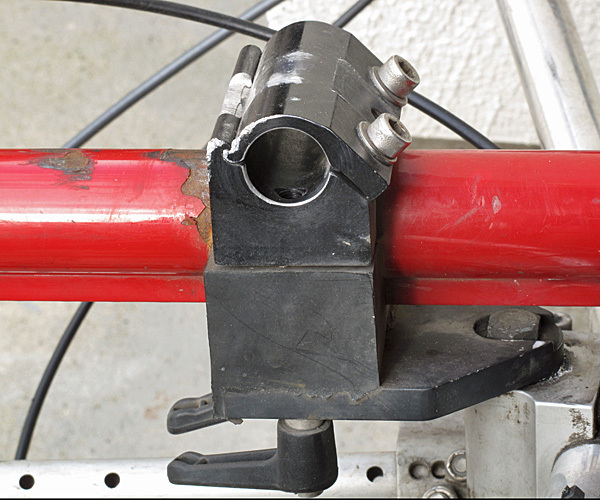 The rod extends about 15mm past either end of where the clamp holds the tubing. I would have extended it further, but I was worried about bending the aluminum tubing too far to open up the bike seat frame enough to get over the end of the tubing. I sanded the inside of the tubing on the broken bike seat and the fractured ends to promote adhesion, and I cleaned both the rod and the tubing with rubbing alcohol. In the comments on Broken bike seat, gflint suggested a silicone adhesive, but I ended up using a flexible epoxy, TotalBoat FlexEpox, that is designed for repairing boats. It is supposed to adhere well to aluminum, have high tensile and flexural strength, and a very slow set time, plus it is fairly cheap at $18 for about 30 times more epoxy than I needed. 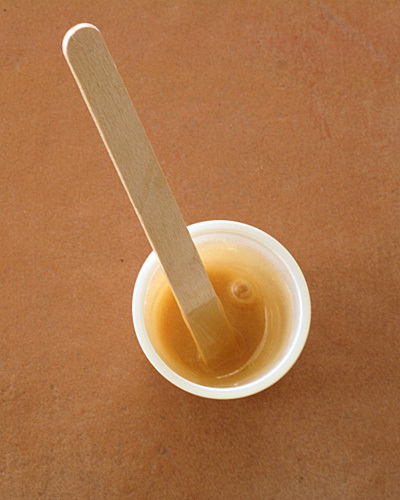 The cough-syrup cups did not make precision measurement of the resin and hardener easy, as both were quite viscous—I hope I got close to equal quantities. I suppose I should have gotten out the centigram scale and mixed by weight—that would probably have given a more precise ratio. The rod glued and clamped in place, with paper towel to keep the rod from sticking to the outside of the other part of the tubing. Excess glue squeezed out of the joint. 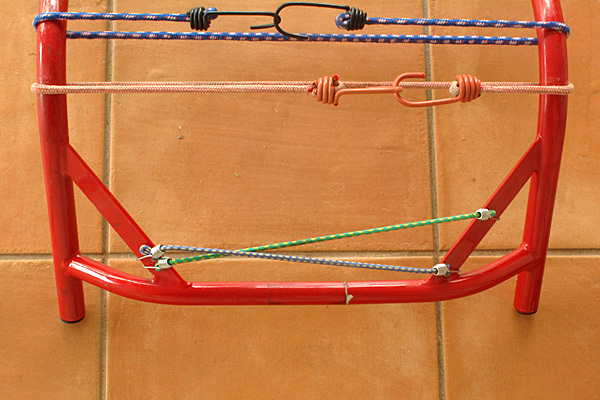 The bungee cords provided a fairly large clamping force, but no more glue oozed out when it was added, so the springiness of the frame alone may have been sufficient. On Monday, I worked on the clamp on the bike. I rounded the edges of the clamp to reduce the stress raising that had led to the first failure—the edges had been quite sharp. In addition to rounding the edges to reduce the stress raising, I also offset the seat by a few millimeters from where it had been, so that the glued joint is now slightly inside the clamp. The frame was quite rusty behind and inside the clamp. I was going to sand the rust spots, prime with metal primer, and repaint the spots, but my metal primer was no longer any good, so I just did some light sanding and coated all the rusty spots with oil. I will have to buy some more metal primer and repaint in a couple of weeks when I next have time to work on the bike. I put the bike seat back in the clamp and replaced the mesh seat, which had been washed to remove the road grime. I plan to let the epoxy cure for another day before riding the bike (they claim a 7–10-hour cure time, 24 hours for high load, but I’ll go a little longer, as it is going to rain tomorrow anyway). I’m hopeful that this fix, which cost under $50, will let the bike seat be usable for the next 15 years. A year and a half ago, I wrote a post, I’m proud of UCSC undergrads, in which I praised UCSC undergrads for rejecting a fee to subsidize the approximately 250 Division III athletes on campus, and last Spring I wrote Not so proud of UCSC undergrads this year, when they voted 63% in favor of being asked if they would support a new fee of $270 a year to support the NCAA athletes (about $4.3 million for 16,000 students, or $14,000/athlete for the 300 NCAA athletes). Perhaps more importantly, as faculty, we have great concern that the termination of UCSC student athletics, a program that distinguishes itself in the classroom and in competition, would signal to the world that we cannot maintain a first-class university. That is BS of the highest order—being a first-class university has nothing to do with athletics, certainly not in the world outside the USA. And even in the USA, a few Division III teams has nothing to do with the perception of the university. Quite frankly, I find it shameful that the administration is spending $1million a year of unrestricted funds on NCAA athletics—that amount of money would hire instructors for about 100 more classes, helping about 3500 students, rather than 300. The big advantage of sports on a campus comes from student participation, not being spectators, so funding models that provide facilities for intramurals and club sports that any student can participate in make much more sense than dedicating funding for a tiny number of privileged athletes. Last Wednesday the Faculty Senate athletics committee had a “town-hall meeting”, ostensibly to get comments from students, but the audience consisted almost entirely of the NCAA athletes and their coaches, so turned into a “how can we get this passed?” rather than having students discussing whether it was a good idea. The few students there who were not NCAA athletes were probably too intimidated by being surrounded by athletes to raise any objections—though one student did bravely ask what fraction of the students benefited from the student fee (a bit less than 2%). There were some very strange ideas being passed around—like that students who weren’t athletes were getting sweetheart funding that the athletes should be getting instead (or perhaps as well). The question was brought up of where engineering students got their funding from (which was not answered). That one struck me as particularly strange, as engineering students generally end up either self-funding, crowd-funding, or getting funding from grants that faculty have spent years trying to get—they aren’t getting any handouts from the rest of the students! A case in point: the iGEM project team needed about $25,000 for the 20-member team for the equipment, reagents, and travel to the iGEM conference. They raised this money through a crowd-funding campaign (which means that most of it came from family and friends). The instructor’s salary was paid out of summer-school tuition (again, paid for by the team members, as there is no general-fund subsidy for summer school). Rather than getting a $14,000 subsidy per team member like the athletes are asking for, they were paying out thousands of their own money to attend summer school to be on the team, and doing crowd-funding for the rest. I have no objection to the NCAA teams running crowd-funding campaigns. There is some industrial sponsorship for a few senior engineering capstone projects (maybe a quarter of all the capstone projects in the Baskin School of Engineering). That sponsorship comes as a result of many years of hard work by faculty and administrators making contacts in industry and begging for support for student projects (and those projects come with several strings attached, sometimes including ownership of the students’ work by the sponsoring company, I believe). Funding for student projects in engineering is much more like club sports than like NCAA athletics—essentially everything is paid for by the students involved, either directly or through fund-raising. The same is largely true of other student groups on campus (theater groups, dance groups, artists, … ). All the groups can apply for tiny amounts of money from student fees through the student government—only the NCAA athletes seem to feel that they deserve much, much more than that. Theater and dance groups often need instructors, the same way that athletes need coaches, but there is no built-in funding for these instructors. For the most part, they are paid for teaching courses, as OPERS coaches are—why should one group of instructors have a dedicated student fee, when others do not? The NCAA athletes at UCSC are not dumb jocks—they have a higher GPA and graduation rate than the campus as a whole, so they must be aware that they are asking for very special privileges that are not given to other students. Why do they or their coaches deserve special treatment? This post is a continuation of Having trouble learning Lagrangian mechanics, looking at electronic systems rather than mechanical ones. Again, this is not intended as a tutorial but a dump of my understanding, to clarify it in my own head, and to get corrections or suggestions from my readers, many of whom are far better at physics than me. For electronics, I’ll use charge as my coordinate, with current $i = \dot q$ as its derivative with respect to time. In all but the simplest circuits, there will be multiple charges or currents involved, which I’ll distinguish with subscripts. is the power dissipated by the resistors in the system: . is the vector input to the system needed to make the energy balance work out. By using charge for each coordinate, the units here will be volts. Potential energy: , which is indeed volts. Kinetic energy: , which is also volts. Dissipated power: , which is again volts (Ohm’s Law). 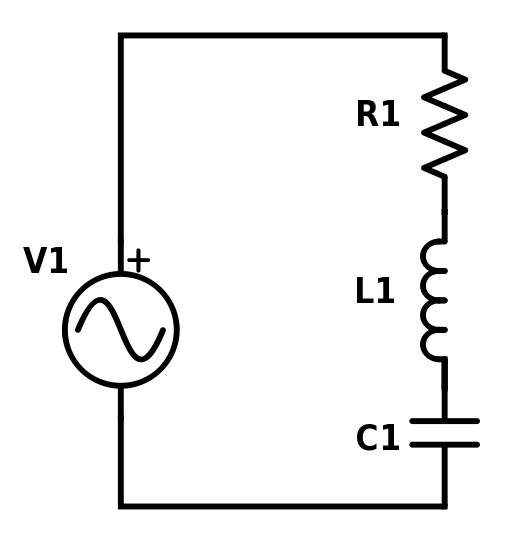 Simple RLC series circuit with a voltage source. We can use a single coordinate, the charge on the capacitor, , so that the current flow is clockwise in the schematic. We get the Lagrangian The power dissipation is , and taking the derivatives gives us , which is the voltage for the voltage source. 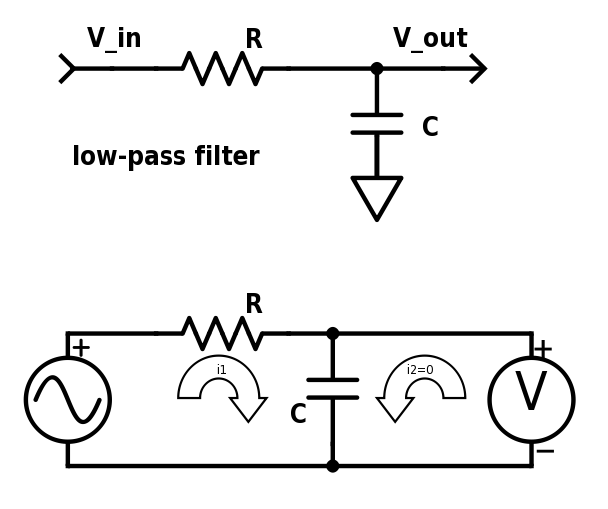 The upper schematic shows the normal way to represent the low-pass filter. The lower schematic shows it with a voltage source and a voltmeter, with two loops (one of which has no current). In other words, we get the voltage at the voltage source and the voltage at the voltmeter. If we want to do anything with these equations, we need to recognize that the and terms are 0 (modeling the voltmeter as a perfect infinite impedance), giving us the usual formulas for the input and output voltage, in terms of the charge on the capacitor: and . Make a charge (and current) coordinate for each current loop in the circuit—including a dummy loop with current 0 wherever you want to measure the voltage. Set up the Lagrangian by adding terms for each inductor (kinetic energy) and subtracting terms for each capacitor (potential energy), and set up the power-dissipation functions by adding terms for each resistor. Take the appropriate derivatives to get the voltages. If needed, eliminate charge terms by using more easily measured voltage terms. I don’t find this process any simpler than using complex impedances and the usual Kirchhoff laws, but it isn’t much more complicated. It may be easier to use the Lagrangian formulation than setting up the equations directly when there are mutual inductances to deal with—I’ll have to think about that some more. Of course, the big advantage I’ve been told about for Lagrangian mechanics is in electromechanical systems, where you model the mechanical part as in Having trouble learning Lagrangian mechanics and the electronic part as in this post, with only a conservative coupling network added to combine the two. It is in setting up the coupling network that I get confused when trying to model electromechanical systems, and I’ll leave that confusion for a later post.